We’re a lighting company, we know. We sell artificial lights for everything from table lamps to elaborate ceiling fixtures. But even we can’t argue with the benefits of letting more good ol’ fashioned sunlight into your home. Numerous studies have shown that daylight increases human productivity and comfort as well as helps regulate our circadian rhythms. Not to mention, natural light is easily the cheapest way to light your abode, saving you money in electricity. So what can you do to maximize the amount of natural light in your home? 1. Take full advantage of windows. As the means by which daylight enters your home, you can start by taking full advantage of your windows. Draw your curtains back and open your blinds during the day. While it can be hot outside, avoid dark, light-blocking window films and go with translucent options instead. Consider opening your windows (with the bug screen left down, of course) to let in some fresh air when it’s nice out. If you’re fortunate enough to have a skylight, make sure it isn’t blocked by tree branches or otherwise obscured. 2. Hang a mirror opposite from a window. Hanging a large mirror across from a wide, open window is an easy way to amplify the natural light in your home. Experiment with different angles to see what new areas the light can reach. This is especially helpful for bringing more light into small rooms and making them feel larger. 3. Paint your ceilings lighter than the walls. White walls and ceilings are ideal, but if you have darker wall paint and like it that way, paint your ceiling just a shade lighter to balance out your space. A white ceiling in an otherwise dark-hued room will make your space look uneven and oppressive, but even a slightly lighter-colored ceiling will make it feel more open and encourage any present sunlight to flourish. 4. Put up reflective wall décor. We’re not saying to go overboard, but reflective surfaces on your walls (similar to mirrors) can do a lot to brighten up your home. Shiny tile backsplashes in kitchens and bathrooms are an excellent way to accomplish this, while metallic wall art is a more trendy option. Picture frames, light fixtures or furniture in a glossy finish are other popular choices. 5. 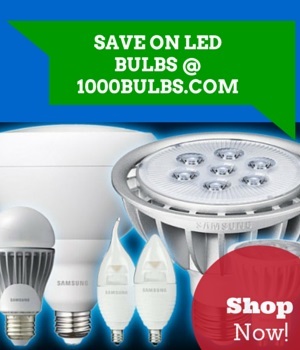 Purchase full spectrum bulbs. So what if you simply don’t have enough windows? Luckily, you can supplement your supply of natural light with full spectrum light bulbs. Full spectrum bulbs may or may not have a full spectrum label. They are defined as any bulb that simulates sunlight by emitting light in the same color temperature as the sun (at least 5000K). Because these lights are very bright, they are best used in kitchens or throughout open floor plans. If you go with an LED option, make sure the CRI is above 80. None of this is to say that you can turn off all your regular lights for good. You’ll still need a little manmade light for evening and nighttime, bad weather days, windowless rooms, and even for more precise lighting during daytime activities such as reading or putting on makeup. These tips are simply here to help you proliferate sunlight as the abundant and natural resource that it is—so take advantage! Do you have any questions or comments on bringing more daylight into your home? Tell us below and be sure to follow us on Facebook, Twitter, Google Plus, LinkedIn, Instagram, or Pinterest for more lighting tips!